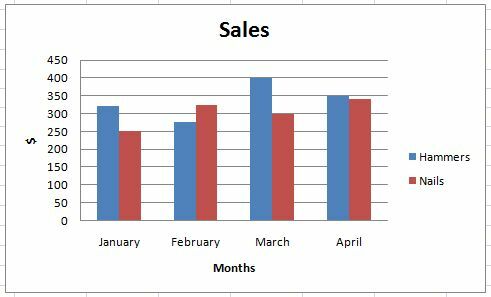 In the previous lesson, we created a column graph using the information on hammers and nails sales between the months of January and April. We also learnt how to write a title for our graph. We will learn a few more things in this lesson. 1) We click on the graphic and we select the option Axis Titles from the graphic toolbar. 4) We will write the name for the axis in this rectangle, which in this case will be "Months". 6) In our graph, a rectangle with the words "Axis Title" will appear on the Y-axis. 7) In this rectangle, we will write the dollar sign "$", which represents the axis. 8) Lets how our graph looks. To modify the type of graphic, we click on it and we look for the "Change graphic type" icon in the toolbar. 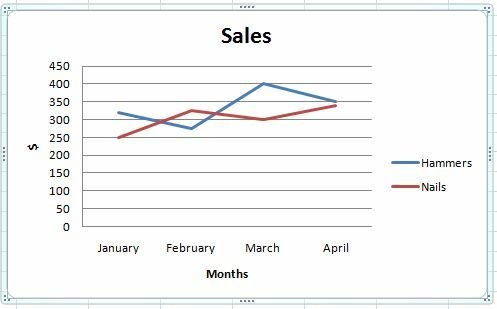 We select the new type of graphic, in this case we will choose a Line graph. The Graph will have already changed in our worksheet.